**UPDATE** The Witt Family (parents of Cooper '15) have pledged a $5,000 match if we meet our goal! Please spread the word and donate online. Only $150 to go! They want to challenge other alumni and parents to support the programs! Thank you, Witt Family. We hope this message reaches everyone in a time of good health and professional success! This is a time for us to reflect upon our time spent representing Pioneer Track & Field or supporting someone on the team. We also hope to pass on our support to future student-athletes. Last year we were able to purchase new uniforms using budgetary dollars and donations from alumni/family/friends. This year we hope to honor the tradition and past accomplishments of the Track and Field program. In the Carroll mission of lifelong service, we ask that you consider making a gift to the Pioneer Track & Field program. Your gift will support the track & field program and assist the team with purchasing new record boards (examples below) and equipment. It is our goal to raise at least $5,000 to help with the cost of these items. 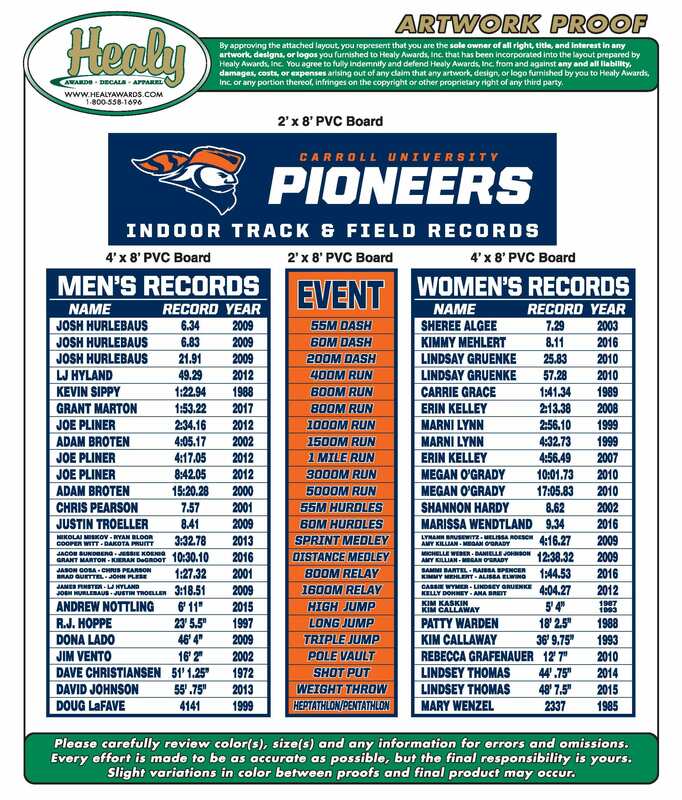 The first goal of this fundraiser is to purchase record boards to showcase our indoor and outdoor records. 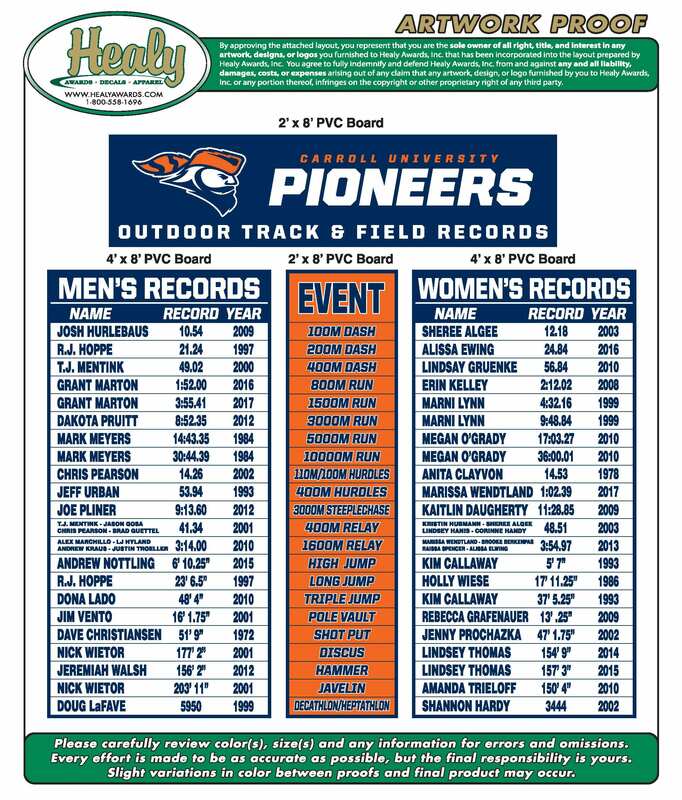 The track and field program has never had record boards. We would like to hang these record boards in a prominent location inside Van Male Field House where they will receive the recognition they deserve. The other goal of the fundraiser is to purchase new practice and competition equipment. The Dennis Punches Track and Field Complex is roughly 9 years old and our equipment is showing the wear and tear of these years. We currently are in need of new hurdles, hurdle gateboards, throwing cage safety net, Steeplechase water barrier seal, along with many other items. * These are only proofs of what the record boards will look like. Records shown may not be accurate. Please notice on the right-hand side of this page there are several different "levels" listed for contributions. These different levels are to help illustrate what the cost for the record boards and equipment are. Any and all donations are welcomed, from $5 on up. All gifts are tax-exempt, and a tax-receipt will be sent to you as soon as a donation is made! Please consider checking with your employer to see if they offer a matching-gift program also! Help us purchase a hurdle gateboard with the new Carroll Athletic Logo. Help us purchase 1 hurdle. Help us purchase a Mesh Water Barrier Screen with Carroll Athletic Logo. Help us purchase 1 record board. Help us purchase 8 hurdles or 1 full cart.